Buildings were evacuated and roads closed after a large fire broke out at a recycling plant in Worcestershire. 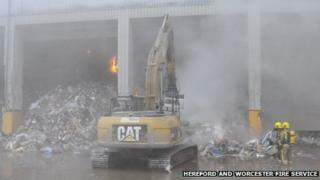 Fire crews were called to Lawrence Recycling, in Stourport Road, Kidderminster, at about 10:50 GMT. At its height, 15 fire engines were called to the blaze. Thick smoke was reported in the area and residents were urged to keep windows and doors shut. There were no reports of any injuries. The fire closed a half-mile section of Stourport Road, but it later reopened. West Mercia Police said smoke blowing across the road had seriously affected visibility. Hereford and Worcester Fire Service said the blaze had been brought under control at about 15:00. A spokesperson said some residents had been evacuated from their homes as a "precautionary measure". The fire service said the thick smoke in the area had not lifted because of the foggy weather conditions. The spokesperson said the blaze had involved paper and plastic materials being stored ready for recycling in a large warehouse at the site. The fire also led to several offices, including the Community Housing Group, based in Foley Grove, being evacuated.